Saucony are renowned for their quality road running footwear, the Kinvara must be one of the most popular road running shoes on the market. While being on the lookout for a new pair of low drop (around 4mm) trail running shoe, I came accross the Saucony Kinvara TR. While there are more and more options becoming available in this category, they tend to be slightly pricey for a shoe I only use on selected trail runs. I was initially a tad concerned about their Kinvara moniker. While for the road runners wanting to convert to trail running this may sound ideal – having a trail shoes modeled on their road shoe – from a pure trail runners perspective a shoe like this is usually not even included in the consideration set. Upon closer inspection however, the Saucony Kinvara TR doesn’t bear any resemblance to its Kinvara road cousin, except for also having a 4mm heel to toe drop. The upper on the Saucony Kinvara TR is quite light and airy, comprised mainly of 2 layers of mesh (a widely spaced outer mesh combined with a fine inner mesh) as well as the welded plastic TPU FlexFilm overlays on top of the outer mesh. 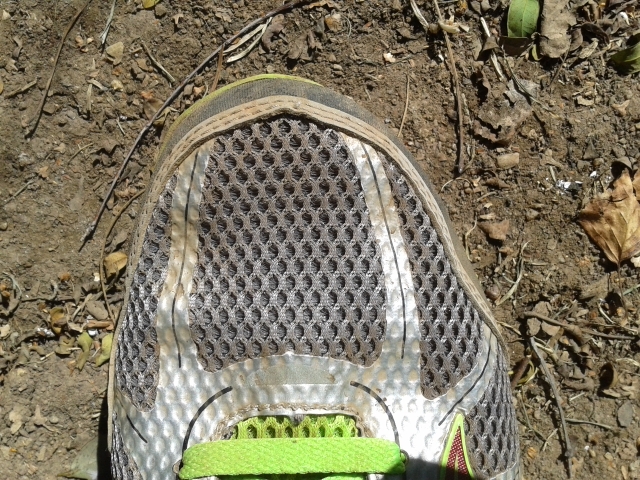 While the airy upper is great for breathability and should dry quickly if wet (I have not yet tested the shoes through water/in rain) it does let in fine trail dust into the shoes. Combined with sweat this could lead to some chafing on very long runs, but I experienced none so far on my shorter stints up to 2h30min. The welded plastic TPU FlexFilm on the Saucony Kinvara TR did manage to lock my foot in nicely together with narrower racing style fit and lacing pattern. Put your hand inside of the shoe and you’ll immediately notice the softness and lack of seams. Running without socks poses no issues if you like to rock it that way and pretend you are Tony Krupicka out on the trails. 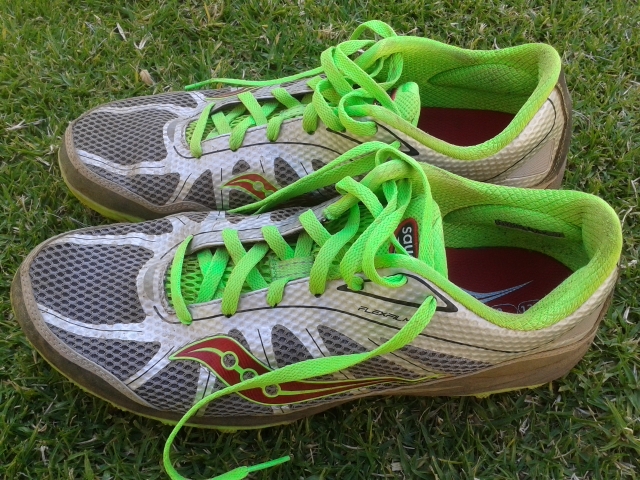 The synthetic leather type scuff guard on the front of the Saucony Kinvara TR is double stitched. The synthetic leather type scuff guard on the front of the Saucony Kinvara TR is double stitched (so shouldn’t come loose) and does a good job of warding of strikes from rocks and branches that would otherwise gauge the soft mesh of the upper. To date it has yet to show any wear, great for a lightweight shoe in this class. The scuff guard also covers the backsides of the shoe, so even when you strike with your heel on the odd downhill, the shoe will still be protected to a degree. The Saucony Kinvara TR trail shoe has an excellent (dare I say best in class?) toe bumper. It’s not the traditional design in the sense that the outsole does simply stop where the upper begins, but curves upward to cover the inner front portion of the toe of both shoes. The result? You can kick rocks on the trail with no consequences. No sore toes, no shoe damage, nothing. I love this design and wish other shoe manufacturers would also implement something similar! No other minimal trail shoe has anywhere near this type of protection, so if you struggle to lift your feet these trail shoes will serve you well.